I had the good fortune to visit two of my best friends in Austin, Tex the weekend before last and while my one friend, Chris, was working, my other friend, Lisa, and I hit the bead stores. Lisa is one of the most talented beaded jewelry designers I know and specializes in Japanese beading. You can see her blog here and her Etsy store here. Check ’em out. One of the stores that Lisa and I went to is called Bead It and is located in South Austin – which, when Lisa, Chris and I went to school at the University of Texas was kinda a place you didn’t want to be in after dark. Here’s my main memory of that neighborhood – a buddy convinced me to go see our first X-rated movie there. Actually, my only X-rated movie. Yeesh. But now, that part of town is hot and happenin’ and has all kinds of cool stores and boutiques – not the kind you need a million bucks to buy anything in, but the kind that remind you that Austin is still weird, still a bit on the wild side, still a place where you can get away from the strip mall mentality of much of the rest of the country. Bead It is the perfect embodiment of that. They also had a small case of Tibetan pendants blessed by monks! Pretty cool, huh? The store is in an old house and it was extremely fun to wander from room to room and dip through all the treats and treasures – some vintage, some not. They also have a great classroom, and while they do not have a rosary or prayer bead making class, they did have a rather fabulous display of rosaries in their window. I also noticed that they had a really good collection of crosses and other pendants that would work well for prayer beads and rosaries. Some of the crosses I had never seen before – and I have seen a lot of crosses! If you go to Austin, definitely check out this fine, funky store. Make a set of prayer beads or a rosary from vintage glass. We were helped by a lovely, young knowledgeable girl named Zoe, and Pake, the manager, or Sarah (the owner?) can also help you out. I plan to visit my friends in Austin again before the end of the year – I hope – and I am going back for sure. I just might have to have that vintage rosary. All this reading about Ireland and the many faiths there has given me a major case of wanderlust. Alas, I will not be going anywhere til May when my husband and I are off for a month in Italy (yes, you may hate me) where he has a conference and some other work. So I decided to do something I should have done months ago, but for some reason (hmm, work, house cleaning, needy dog, life in general) just never got around to – sharing with you all the fantastic prayer beads my eldest son Shawn and his girlfriend Cecilia brought back to me from their 5-month trip through Europe, the Middle East and China. I think one reason it has taken me so long to show these beads here is it just seemed a huge task – they sent back and brought back so many from so many countries! But this morning, I thought, why not just do it in parts? So today, I want tp share with you some prayer beads Shawn brought back from the first six weeks of his trip, which he made with another classmate, through Turkey, Syria, Jordan, Israel and Egypt. So here goes . . . .
that came from Istanbul, Turkey. Does anyone know what they are called in Turkey? I am thinking “tasbih.” Along side it, you see an evil-eye bead that he also brought me. I love this collection, because it tells you a lot about the faith and practice of this country – Turkey is still a secular country, but it has a growing religious fundamentalist political party. The people there – mostly Muslims – can be very devout (thus, the subhah), but they are also superstitious (thus the evil eye bead). If you have my book, you can find a description of the history and use of both of these kinds of beads on pages 8-10. I was lucky enough to travel in Istanbul and western Turkey 15 years ago and I remember seeing these blue eyeballs everywhere. Kinda creeped me out. Not this one, tho. Syria – Shawn went to Syria next, where he had a wonderful time in bazaars and out in the desert, too. I guess he did not find any proper prayer beads, as he brought me these two necklaces. Neat, huh? Look at the arrowhead-like thing on the brown one. I suppose I could use that for a terminal charm. has coins, one has little metal balls, kind of like bells, and one has little metal drops. I do not know if there is any significance to these kinds of tassels. Anyone know? Also, notice that the prayer beads on the far right – the white ones – have some kind of writing on them. I am sure it is Arabic – anyone know for sure? Can anyone tell us what it says? If you have an Arabic friend, please forward this blog entry to him or her and clue us in. I am dying to know. Israel – And here we have the first set of Catholic rosaries of the trip. Both are made from olive wood, very common to Israel, and both have a little window behind the medal that contains something it tells me is “terra Jerusalem” – the soil of Jerusalem. It’s kind of reddish in color. Pretty neat. He also sent two sets of subhah, these both with silk (or silk-like) tassels. Both are made from some kind of hard plastic or resin. Egypt – OOPS. I forgot to photograph Egypt. We’ll have to save that for the next entry. So, aren’t these very cool? 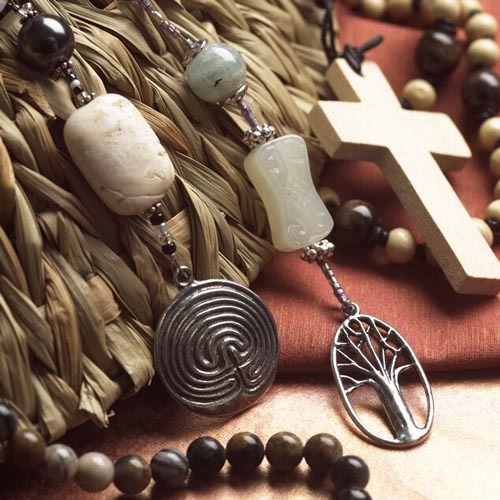 Do any of you readers have rosaries or other forms of prayer beads from this part of the world that you could share a picture of or a story about? I hope you have noticed that one of the lists I keep on the right side of this blog is of local bead stores in the U.S. that offer classes in rosary and/or prayer bead making. I was updating the list about a week ago – sadly, two or three stores had not only stopped offering the class, they had completely closed their doors! – and I sent out a query to all the remaining stores asking them to send me pictures of their rosary/prayer bead samples. I also said I would welcome any pictures of rosaries/prayer beads made by students in the classes. So far, the great women of Bead Boutique in North Canton, Ohio are the only ones who have gotten back to me with pictures. Hey, what is it about Northeast Ohio and prayer beads? Some of you may remember a post I wrote about the fantastic women of Bonita Bead Boutique in Maumee, Ohio who hosted a trunk show of the prayer beads pictured in my book in their store last April. LOTS of prayer beading going on up there! Anyway, Bead Boutique’s Kathy, Jen and Megan sent two pictures of the samples they use to promote the class and promised to send some of their students’ work after the next class. So today – Christmas Eve – enjoy these pictures! I hope they inspire you to make some prayer beads today. I am particularly fond of the aurora borealis strand! 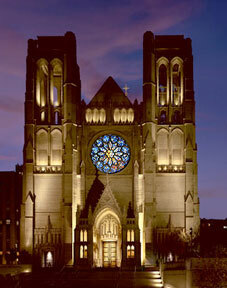 Tonight, I head off to church for the “midnight” service, a time I always look forward to. As usual, my prayer beads will go with me. Just wanted to make sure you all saw this brief piece in the New York Times on Sunday. It describes the experience of a busboy at the Ambassador Hotel who saw Bobby Kennedy’s assassination and placed a rosary in the candidate’s hands. I just thought it was a very nice way to remember the event 40 years ago that’s been in the news so much lately. I haven’t blogged much lately because of being overwhelmed with work – which is good, right? This Thursday my husband and I travel to Pasadena for my eldest son’s college graduation. I’ll do some blogging from there. See you soon.